Do you guys watch the show on TNT The Last Ship? We love it and Matt loves the main character Tom Chandler. In fact we were talking about how if Matt could be a TV character he thinks he would want to be him before leaving on our vacation! Why does this matter? Well, I had NO idea that in the harbor of Charleston was Patriots Point…. but I am so glad we toured it! 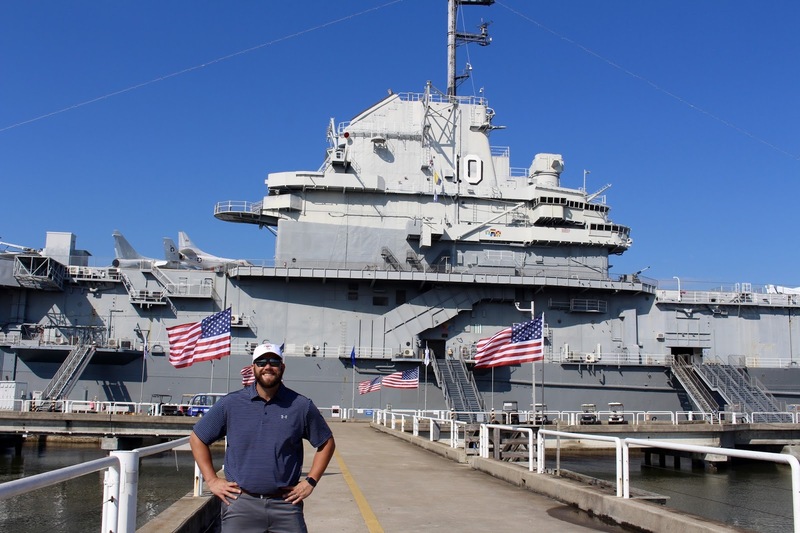 In the harbor sits a Destroyer USS Laffey and the Battleship USS Yorktown and Matt was able to for a brief moment have his time as Captain Tom Chandler. If you are going to Charleston I highly recommend you take the time to give this naval museum the respect it deserves! We are so glad we did! HERE is the site to learn more about visits! For all my Bravo friends…. yes that is THE Ravenel Bridge of our crazy Southern Charm star! 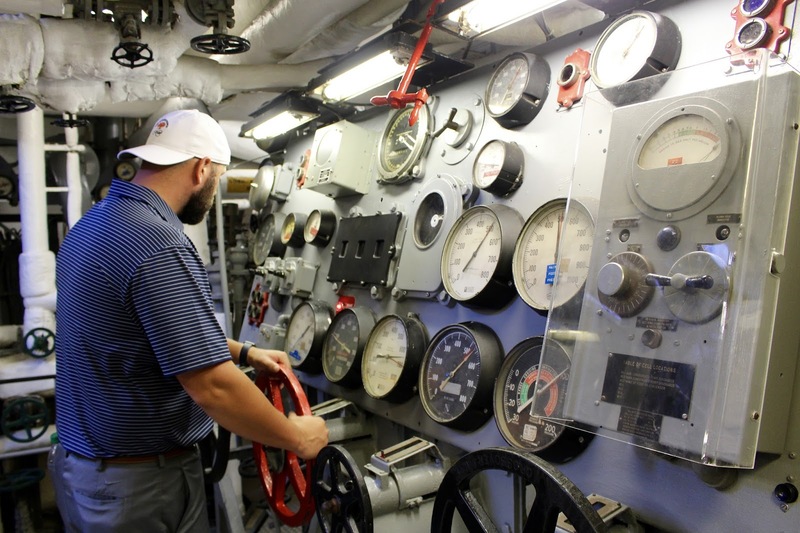 Something that was also neat to see while touring the ships is how all the volunteers were Veterans. Some of them even served on one of these ships. And the Destroyer was actually hit during a war and people lost their lives…. so yes, these ships did see combat. When you finally get close you see how immense these ships are, it really is breathtaking. After being inside them I can say 110% I would NEVER survive….. the closed in space, the heat…. just everything is the stuff my nightmares are made of. And yes, much of the ship is now interactive which was fun for us! Inside the Yorktown there are rows of aircrafts, it blew my mind how BIG a ship can be to house aircraft inside and on top. I know I know, this is normal common sense but seeing it first hand is another thing all together! YOU GUYS…… do you see it!!!!!! From the top of the battleship we saw Dolphins! It literally made my day! The Yorktown also houses the National Medal of Honor museum, which was so humbling to see. And look at this, the youngest recipient was ONLY 12 years old and this was his battle drum. I mean, can you imagine? Patriots Point was a highlight of the trip for us both, with the exception of THE HEAT and humidity. It was unreal! The legend stems back to the colonial days when Charleston was much more of a shipping city. When a sea captain returned home from a long voyage he would have precious, exotic souvenirs of his voyage. The captain would spear a pineapple on his fence post to let his friends and neighbors know that he had returned safely. The pineapple earned its symbolic meaning because friends would come over for dinner that night to drink and hear the captains adventure tales of piracy, scurvy, and encounters with new lands. Who knew your favorite fruit had a real adventure tale behind it? 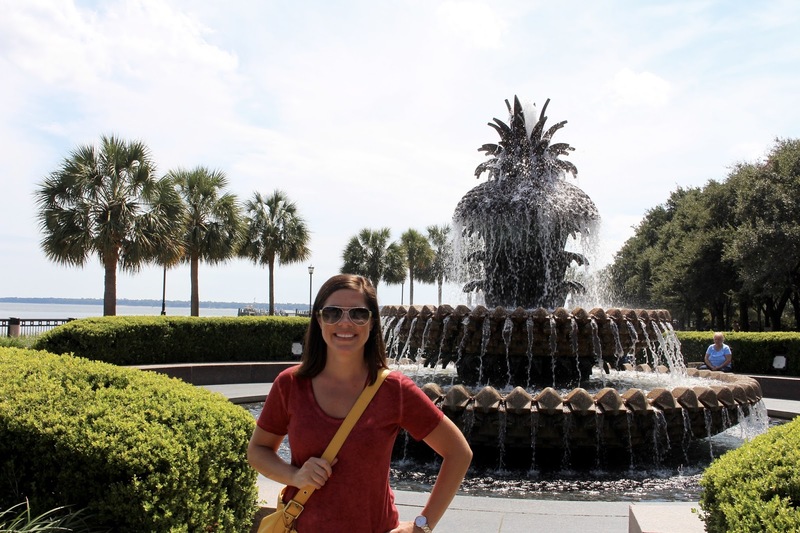 Stay tuned tomorrow I am going to post YOUR very own WHERE to eat in Savannah and Charleston guide! I hope you are still enjoying these vacation posts as much I am loving the memories! Still loving the virtual vacation and bucket list. ;)I toured a smaller ship once, it was so hot and small, I agree! I love the artifacts they have kept and to finally hear the history about the pineapple.Beautiful bridge and Flags. Glad you got to see a dolphin!